Disturbances in drum level are caused by fluctuations in main steam flow. 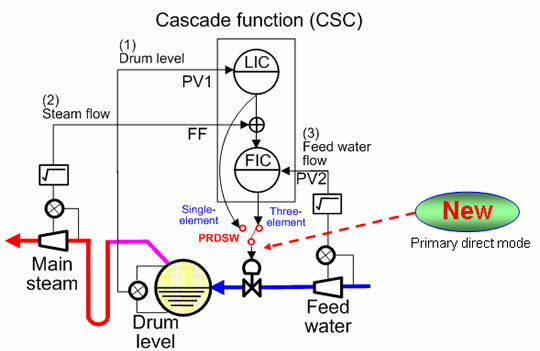 Figure 1 shows a typical drum level controller, which measures the drum level (1), main steam flow (2), and feedwater flow (3) and manipulates the feedwater control valve to regulate the drum level. This is three-element control. This three-element controller is a so-called cascade controller in which a drum level control unit is cascaded into a feedwater flow control unit. During startup of a boiler, both the feedwater and main steam flow rates remain below the measurable ranges, and this makes the three-element control with a level controller and flow controller unstable. In such cases, it is effective to use single-element control in which the feedwater controller is bypassed and the drum level controller directly controls the feedwater control valve. The YS1700 Programmable Indicating Controller can be tailored for various applications by running a user program, and offers high reliability thanks to Yokogawa's proprietary technology, user friendliness, and expandability.